Locust Infestations were declining due to control operations and drying vegetation; nevertheless, vigilance and control operations must be maintained to reduce swarm formation and migration to spring breeding areas. As more groups, bands and swarms form from second generation breeding along the Red Sea coast, some swarms migrated, leading to increased risk levels in several countries. 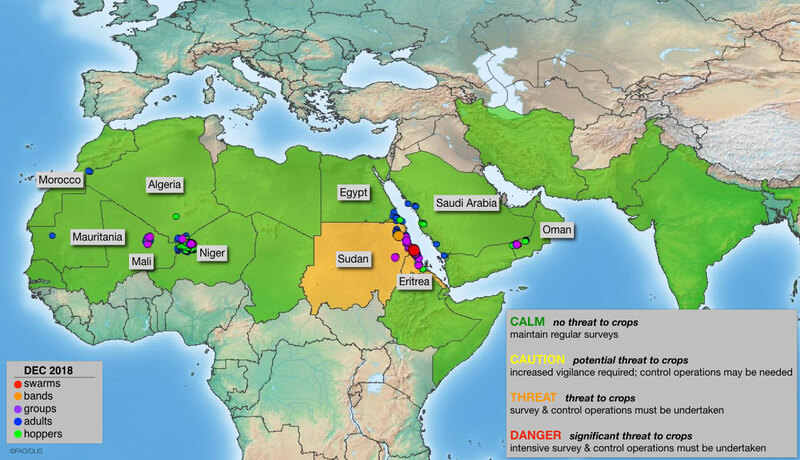 The Desert Locust threat increased significantly in Sudan and Eritrea as a result of an outbreak that developed in winter breeding areas along the Red Sea coast during December, which is likely to continue for several months.